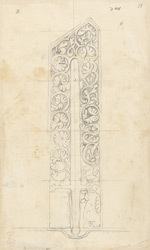 Remains of an ancient cross in Killaru churchyard Ila, drawn by John Frederick Miller in 1772. This stone was found lying flat upon the ground in the churchyard ... the square stone (was probably) the base on which the other was fixed. Nothing remains of the village of Kilarrow (Killaru) apart from the churchyard.